A tangled, mangled junction of train lines, roads and waterways. Where minor celebrities hang out with minor criminals and where tourists and moody teenagers mingle. In the heart of Camden, where rail meets road meets leyline, you'll find the Arcana Emporium, run by one Alex Verus. He won't sell you a wand or mix you a potion, but if you know what you're looking for, he might just be able to help. That's if he's not too busy avoiding his would-be apprentice, foiling the Dark, outwitting the Light and investigating a mysterious relic that's just turned up at the British Museum. Visit Benedict Jacka's website for more information. 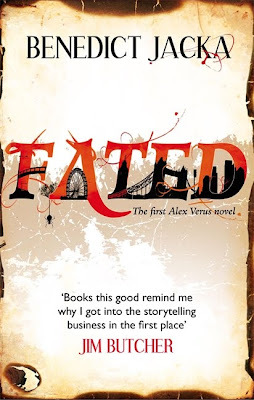 I have been saying for a while now that I want to find more urban fantasy written by British authors and set in the UK so when my Dad discovered Fated in the library I jumped at the chance of reading it. A story set in London with Dark and Light mages living unseen amongst the human population was just what I was looking for and I have to say that I loved the setting. It was nice to see London through Alex's eyes and I'm now itching to visit Camden market and the British Museum! Alex may be a mage but as a diviner his abilities are limited, he can't use his power as a weapon and he can't shield himself from magical attacks. Actually his powers are much more interesting than that - he is able to look forward and see the future. Not just one future but infinite different futures so he can foresee the outcome of any actions he might take and work out in advance what gives him the best chance of success. When you can see what your enemy is about to throw at you and the best way to avoid it you end up with a bit of an advantage. I've not come across this ability before and found it fascinating to read about. It would have been easy for this to take away all sense of suspense from the story but somehow Alex manages to keep readers on their toes even when he is warning you of attacks that are about to happen. Originally apprenticed to a Dark mage Alex made plenty of enemies when he escaped and decided to go his own way. We have been given hints at some of the things he went through at the hands of the Dark mages but I think this is something that we are going to learn a lot more about as the series continues. Although the Light mages are supposed to be the good to the Dark mages' evil things aren't quite as black and white as that. Alex learnt the hard way that the Light mages aren't really his friends either and just wants to be left to live his life in peace and quiet. As one of the only diviners in the country that isn't going to be easy though. The discovery of an ancient artefact with powerful protection wards that only he has a chance of getting past means Alex suddenly finds himself the most sought after mage in London. Because when an artefact that could change the balance between the Light and Dark is at stake there are going to be a large number of people who want to get their hands on it. As Alex tries to recover the artefact he must decide which faction he trusts to use it wisely. He also has to figure out a way to make it through the next few days in one piece when each side of the war are threatening to kill him if he doesn't help them. Luckily Alex has a few friends to help him with the challenge. His would be apprentice Luna comes with an interesting curse of her own that I'm looking forward learning more about as the series continues and Starbreeze added some light relief to the story. Although I enjoyed the story it didn't quite wow me as much as I had expected it to. I can't put my finger on anything that I didn't like though and I'm sure that the series will only grow stronger with each instalment. 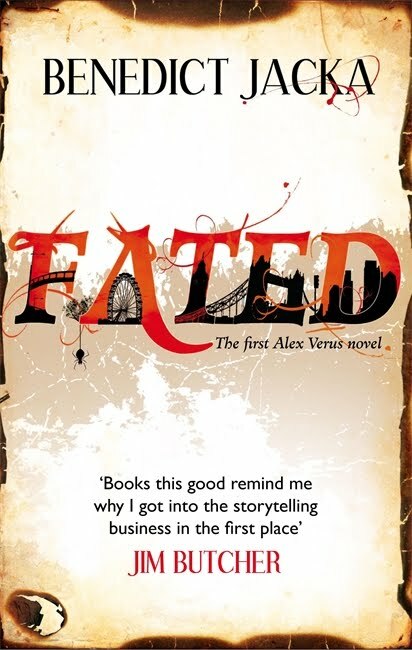 Fated is an interesting debut from Benedict Jacka and I'm looking forward to reading about Alex's next adventure. I quite enjoyed this one (and Fated). They're not perfect, but quite fun, and I'm getting to really like the characters (especially Luna). @ Mel - I hadn't heard of The Devil You Know but it sounds really good so I've just ordered a copy from my library! Thanks for the recommendation :o) I hope you enjoy Fated! June 2012 Recap & a Quick Housing Update!